I love when I get to do bridal sessions! Everyone does an engagement session, but very few do bridals. I guess I need to make people read my post about why bridals sessions are important. Anyway, Sarah had a bridal session at Mount Sequoyah, and it turned out beautifully! Mount Sequoyah is a wonderful place that doesn’t always get a lot of attention in Fayetteville. Everyone knows the area with the cross that overlooks the city, but there really is a lot more to the place. There’s an outdoor ceremony site, a chapel, and a ton of other buildings and space. 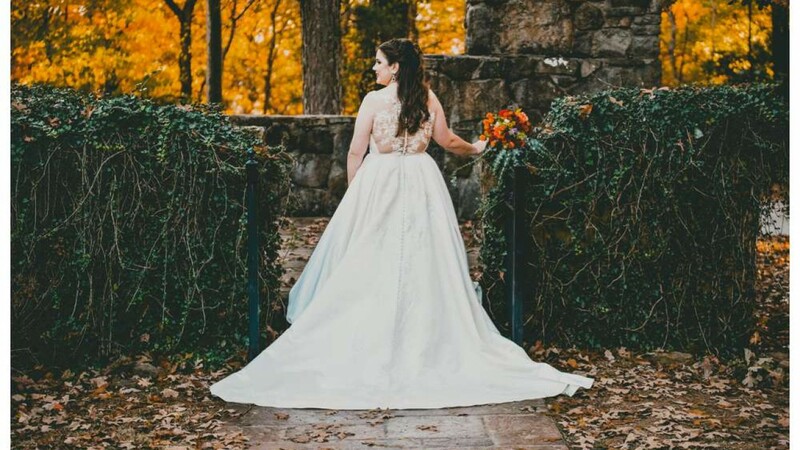 Sarah and her family have strong connections to Mount Sequoyah, so she knew this is where she wanted to do her bridals and her wedding. With all her connections, we were able to have access to everything and do some really fun stuff! The bridal session was at the beginning of November, so the weather was still pretty nice and we still had color in the trees. We started photos in between a few of the buildings with trees in the background. Then, we moved near the ceremony site where there were even more trees. Sarah’s mom brought this little lantern, and it went really well with her red shaw. The real interesting part of the day came next. One of the buildings has a great view, but you have to be on the roof to see it. To make it more interesting, you have to climb a little ladder to get there. This was quite the trick for everyone. It was tough for me with all of my equipment, and Sarah had to change and change again to get up there with her dress. It was a bit of effort to get up there, but the view was worth it. The sun was setting through the trees and we could avoid all the clutter of the city and normal skyline. These were probably my favorite photos from the session. I really do believe bridal sessions are helpful and important. On Sarah’s actual wedding day, the weather and trees weren’t as nice, and there was no way we could get on that roof. Sarah’s bridal session at Mount Sequoyah allowed us to do so much more, and get some really beautiful photos.